Pro or New to Oxygen? Read this…Maybe you didn’t know this. There are many of you who are new to using oxygen but also those of us who are practically pros at oxygen use. But there is a topic that is important to talk about that even some pros don’t realize at how important it is. I may be saying things that you already know but bare with me. I’ve had a few people who have asked about this topic who just didn’t know that they should be doing this. Ok ok.. I will just jump right in and not prolong this mysterious topic. If you are reading this blog you either were prescribed to use oxygen, whether it’s 24/7 or just during exertion or with activity, OR, you have a relative who uses oxygen in this way. Ok… I know you are probably thinking.. “Get on with it.. spit it out already!” Whew! I’m getting there. What I’m leading up to is this: No matter how you were prescribed to use oxygen (24/7 or as needed for activity), taking a shower in my opinion is considered an activity AND in my personal opinion you should use your oxygen while you shower. Think about it. Do you get light headed if you are taking a shower and not using your oxygen? Feeling a little tired and/or woozy? Maybe you feel a bit like you may faint or pass out? Are you feeling like washing your hair is wearing you out? It’s humid in the shower. What would you do if you actually fainted in the tub alone all because you didn’t use your oxygen? 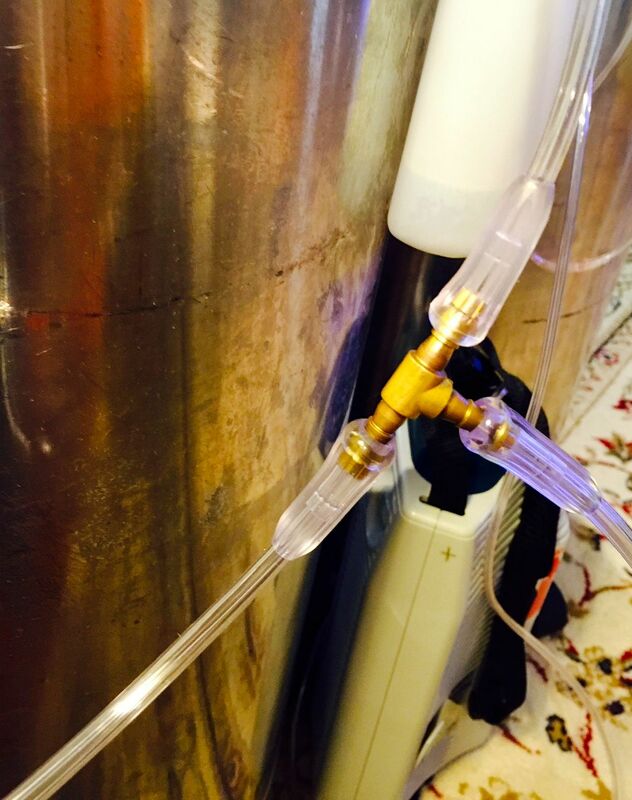 Whatever type of oxygen machine or tank you use, you can still leave your machine or tank in one room and use a 50 foot tubing to run all the way to the bathroom. The tubing can get wet..even submerged. I gather up enough slack in the tubing and drape it over the side of the tub and it lays on the bottom of the tub while I shower. When I’m done, I use a towel to dry it off. It’s that simple. By using oxygen while you shower, you aren’t taxing your heart as you would if you didn’t use it while you showered. After all, it’s all about staying safe and healthy. So be safe. I am about to explain the basics of an oxygen concentrator for all of you who are confused about this machine. (click on the pictures to see a bigger view) First, let me mention that there are different types of machines or forms of oxygen. There is an oxygen concentrator (what I’m about to show you), there is compressed oxygen that comes in a metal cylinder, liquid oxygen which is pressurized and contained in a metal reservoir, and then there are battery powered oxygen concentrators which are mainly used for portable use. I hope with this list, I didn’t confuse you. In the pictures below is a Respironics Oxygen Concentrator. It provides up to 5 Liters per Minute of oxygen to a patient. You can see that I do not use a white humidifier bottle with this machine. A humidifier bottle contains distilled water which the oxygen flows through a little tube and bubbles up through the water which hydrates the oxygen that you receive. However, I connect my oxygen tubing straight to the machine. It’s recommended to use the humidifier when using oxygen at a higher flow, such as what I do (6LPM). 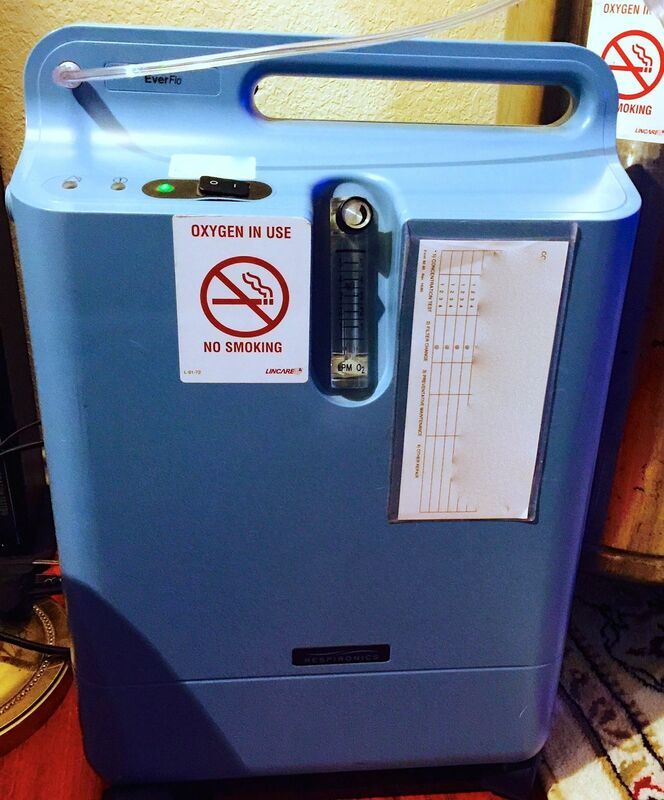 An oxygen concentrator is an electrical machine that plugs into a electrical wall outlet. When you turn on the machine, it intakes room air through a filtered vent. It filters the room air through it’s sieve beds, separating everything from the oxygen; which is then flowed out to you through the oxygen tubing connected to the machine. All the other “air” is expelled through another vent usually located at the bottom of the machine. You can feel it. It’s the warm air coming out of the machine. It’s VERY important to NOT block the vent that expels the air from the vent. The Oxygen Concentrator should be located in a central area of your home allowing you to reach everywhere you want to go. Also, do NOT enclose the machine in a small room like a bathroom or a bedroom. This machine needs air and ventilation to keep it cool and functioning properly. 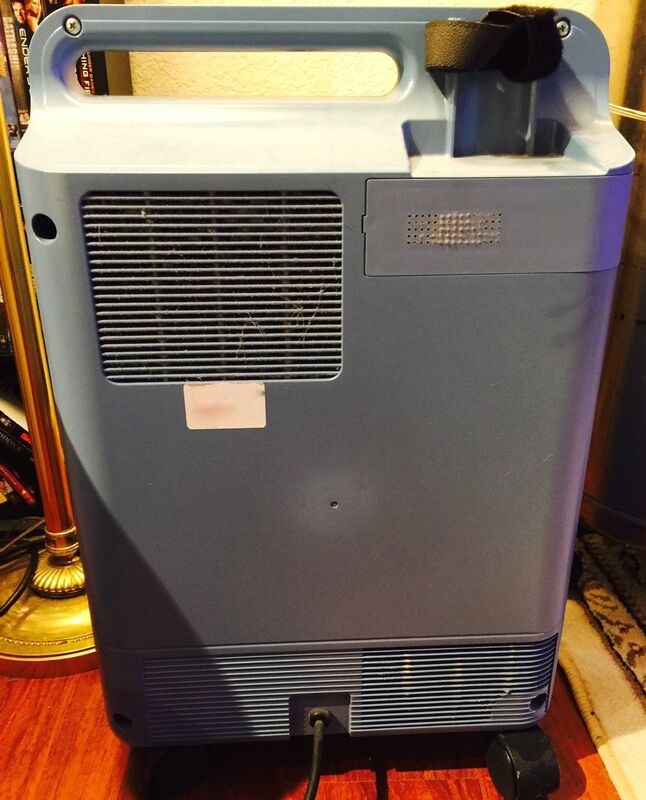 The next important thing about an oxygen concentrator is about keeping the vents and filters (some have just one that needs to be changed) clean. As you can see from the pictures below, my vents are gross. But don’t worry, I cleaned them with a dry cotton sock. (The sock went straight into the washing machine!) You can change the filter if you know what you’re doing or have been taught by the DME (Durable Medical Equipment) company who provided the machine for your use. Some oxygen concentrators need to have their filters changed more often than others. Some older machines have more than one filter to change. My one filter is located behind the little panel in the upper right corner in the picture below. It’s REALLY important that you contact your DME company and ask them to come out and change the filter of your machine if you haven’t had it done within 6 months. Ask them how often it needs to be done on your particular machine. IMPORTANT: Do NOT try to open your machine or try to fix it if it is having problems. Call your DME immediately. As you may have noticed, my oxygen concentrator is sitting beside my liquid oxygen reservoirs. I use both the concentrator and liquid oxygen at the same time with a very handy device called a splitter. The splitter in the picture is made of brass but I also have an emergency backup splitter made from plastic. Remember, I always have a backup. When a person has to use oxygen 24/7 as I do and many of you do too, it is so important to have back ups of things like 50ft tubing, the nasal canula for your portable, tubing connectors, bipap supplies (mask, hose, head gear, filters, & memory card). You don’t want to be caught on a weekend or a vacation when something breaks and you need another part. Been there, done that… but no more! Hey, don’t forget that duct tape! Trust me… you’ll thank me later. haha! I hope I’ve explained the basics of an oxygen concentrator in an easy-to-understand way. As always, you can email me at goredrider@gmail.com *hugs* I hope you are making your HAPPY JARS for 2015! Read about it here. So you use a bipap and you want to clean your bipap or you just want to see how someone else cleans their mask. You’re in luck! I finally took some pictures for you. First, let me introduce you to my bipap mask. 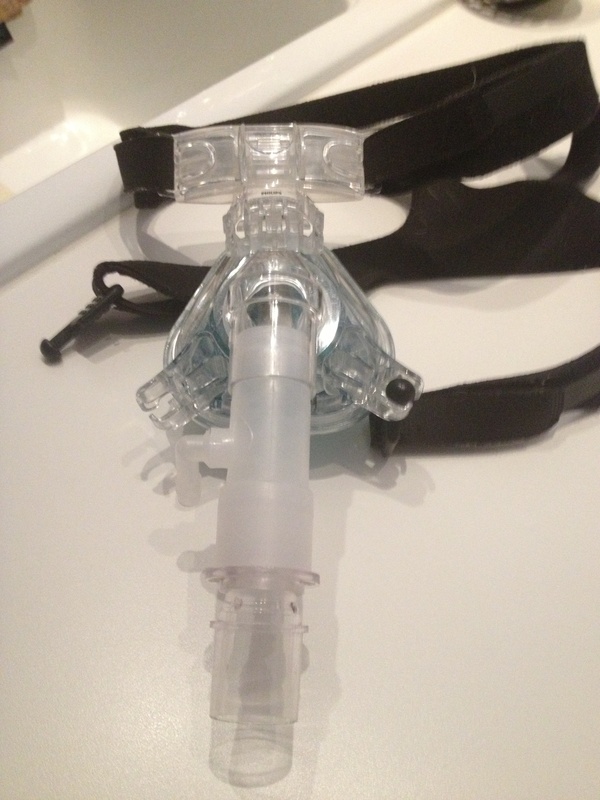 Here you can see my bipap mask with the head gear attached at the top by slot openings and at the base of the mask by little pegs-n-grooves (my name for this closure type!). Cleaning the Bipap Mask: I first take apart the connected tubes and head gear. I inspect each part for wear and tear which is very important. You don’t want to end up having the mask break in the middle of the night. Trust me.. this has happened to me several times. Some of the weakest parts on a Bipap mask, that I’ve noticed over the years, are the top forehead bridge section – where it’s adjustable and the places where you connect the bottom portion of the mask to the head gear. 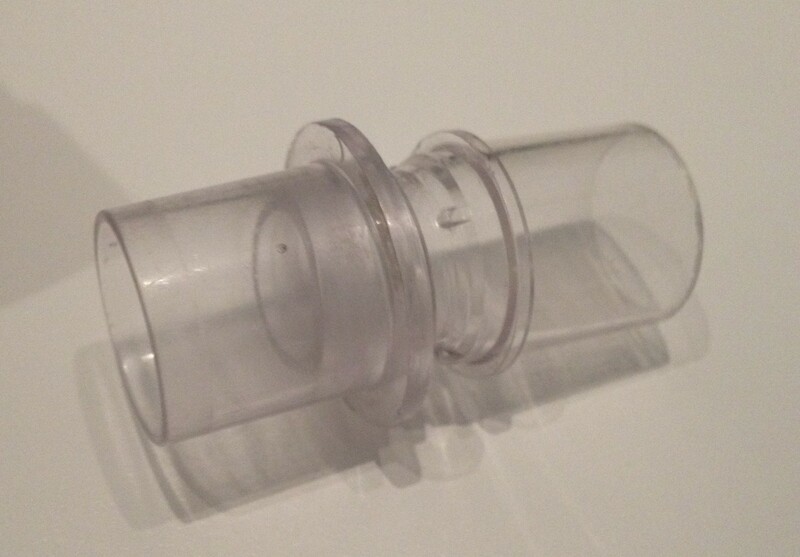 Here is a swivel tube that I connect to the end of the Bipap tubes. It allows the mask and the big hose, coming off the Bipap machine, to swivel. Allowing more freedom to move your head without having to adjust the hose at night. This is the tube used as the oxygen port for my Bipap mask. The arm on it is where I attach my oxygen tubing and it also swivels around for convenience of movement. I clean all these pieces of my Bipap in mild liquid dishwashing soap. I don’t use antibacterial soap. I fear that the chemicals used in these soaps could harden the silicone in the mask making it weaker and fall apart. Remember, most insurance will pay for replacement masks & tubing every SIX months. but you have to call to request them from the DME company that services your Bipap. 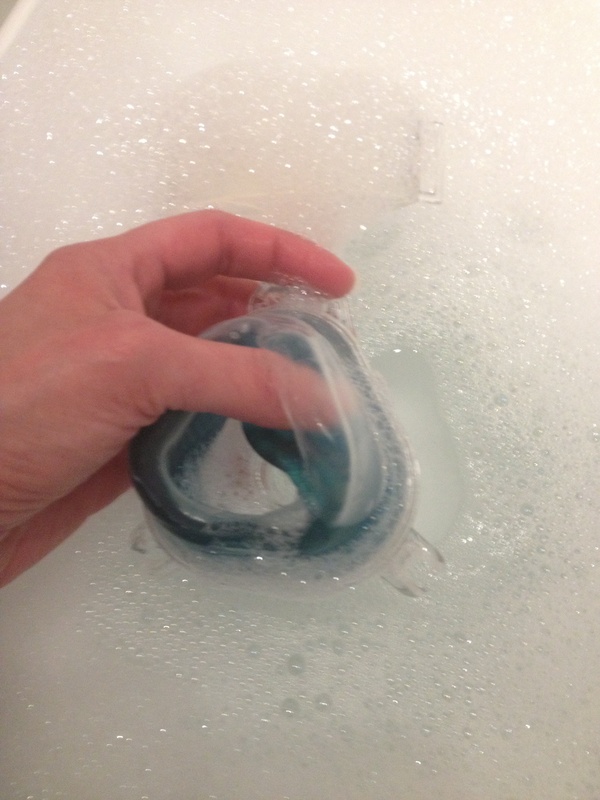 When I wash my Bipap mask, I use just my hands in warm sudsy water in a small basin (NOT MY SINK!). I gently bend down the inner soft blue silicon cushion and rub my finger tip down the inside between the thin outer membrane of the mask and the gel cushion. Don’t push or use fingernails to scratch anything. You don’t want to tear any part of the silicone gel cushion. When I’m done cleaning the mask and tubes, I rinse each piece in cold water. Make sure all soap is rinsed off. Use a paper towel to dry off each part. The mask is the hardest to dry. I have to bend the blue gel cushion down gently and slide the paper towel in the space to absorb most of the moisture. You won’t be able to get it all. Today, I used my hair dryer on COLD air and on the LOWEST setting to dry the inside of the mask. Make sure, if you try this, that the air from the hair dryer remains cold. You can also let it air dry. For me, I tend to need my mask for naps. So, air drying is ok but it is time consuming. Thus, the reason for the hair dryer. It’s really important to get the Bipap mask dry. You don’t want to have mold or mildew growing somewhere where you breathe from. To disinfect the bipap mask: Soak the mask in a solution of one part white distilled vinegar to four parts water for 20 to 30 minutes. Rinse in cold water and then dry with paper towel and then air dry. I do this every so often. I know this is bad of me to admit this but I don’t clean my mask as often as the guidelines suggest (once daily). I’m not neurotic about cleaning my mask. If I see that it not clean, then I wash it. My best advice is to keep your mask and Bipap machine clean and in good working order. Keep everything dust-free and off the floor. Check your filters often so you know when to replace the paper filter and wash the sponge filter. Keep yourself healthy!